Jean Abraham, Jasmin Fisher and Rebecca Fitzgerald are named in Top 50 outstanding female leaders in UK healthcare. Jean Abraham, Jasmin Fisher and Rebecca Fitzgerald are named in a new report unveiling 50 female leaders in healthcare business in the UK. Produced by BioBeat, 50 Movers and Shakers in BioBusiness 2017 emphasises how diversity of thinking is critical to the success of the sector in the UK. The report also celebrates how women are driving innovation in healthcare. Jean Abraham, Academic Honorary Consultant in Medical Oncology, University of Cambridge, is exploring how high risk and/or hereditary breast cancer patients can benefit from newer drugs, with specific, targeted actions and fewer side-effects, earlier in their treatment pathway. She and her group use molecular stratification and precision cancer medicine research to understand differences in genetic changes between these breast cancers and how this affects their response to new drugs. She leads multiple local, national and international studies investigating these questions. 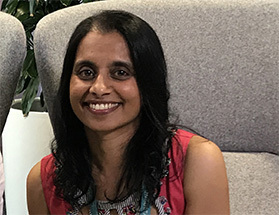 Jean previously held a Cancer Research UK National Clinical Training Fellowship and has a PhD in pharmacogenetics from the University of Cambridge. Jasmin Fisher, Associate Professor, Department of Biochemistry, University of Cambridge and Senior Researcher, Microsoft Research, Cambridge. Jasmin created the field of Executable Biology to change drug discovery from data-centric to mechanism-centric. The core of the approach is to devise models based on reverse engineering of cellular mechanisms, drawing in data as needed, rather than data being the starting point. In collaboration with AstraZeneca, she developed a model for cell signalling in Acute Myeloid Leukaemia which has led to personalised tailoring of drug combinations to increase sensitivity and successfully overcome drug resistance in patients. Trained as a neuro-immunologist, Jasmin’s main interest is to understand how cancers evolve and respond to specific treatments. Professor Rebecca Fitzgerald, MRC Cancer Unit, University of Cambridge and Honorary Consultant in Gastroenterology, Addenbrooke’s NHS Trust. Rebecca works on the rapid early detection of cancer to improve cancer outcomes. She and her team have created CytoSponge and associated molecular tests to identify early stage oesophageal cancer. A patient swallows a pill-sized capsule with a sponge inside, this travels to the stomach where the capsule opens. The nurse pulls the sponge out and as it moves up the oesophagus it collects cells for molecular testing. The device has been licensed to Covidien GI Solutions and is in late stage primary care trials for Barrett’s oesophagus. The winners will collect their awards at the BioBeat17 summit Re-shaping biotech partnering on 16 November at The Francis Crick Institute.